15 занятий японского языка и 4 занятия по поп-культуре Японии в неделю. Идеальный курс для любителей японских комиксов Манга и анимации. Вас научат рисовать Манга, отведут в Мэйд-кафе, кафе, где официанты одеты в стиле мэйдо (горничная) и ведут себя с клиентами как с любимыми хозяевами, вы сможете поучаствовать в фотосессии в стиле косплей, одевшись героями любимых аниме. На Хоккайдо очень много художников Манга, и история острова неразрывно связана с этим направлением. Поэтому мы считаем, что Хоккайдо самым подходящим местом для его изучения. ※более 4 недель курса, каждая последующая неделя 26,280 йен (10％OFF). ※■В стоимость включены все расходы. ※Свободный выбор мероприятий и поездок в выходные дни. ・Экскурсия в школу Аниме, поход в аниме-шоп, рисование комиксов Манга. ・Так же Вы можете участвовать в Наших мероприятиях! ※We also use music, cartoons, interviews or reports in addition to the textbook to strenghten your oral skills. At Hokkaido JaLS, every level aims at learning how to actually use Japanese instead of simply studying it. Beginner 2 We will work on basic grammar and short sentences. At the end, you can speak about your friends, hobbies and experience. Elementary You will be able to use the grammar and vocabulary learned in the previous level, Beginner2, with more complexity in order to have a normal conversation. You will learn how to express yourself politely, and talk about your feelings. Pre-intermediate The Japanese level is becoming more and more difficult, and we like to focuss on the “usable” Japanese instead of the “I understand but I cannot speak” one. 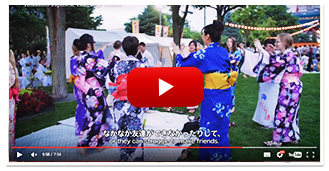 Once passed, you can speak about yourself and your country’s culture in comparaison to Japan. Intermediate From Intermediate, we learn sentence patterns in order to strenghten your conversation skills. Then, this class is taking care of parties’ orgranization, interviews…etc in a word, the Japanese to communicate and exchange. Upper-intermediate More complex patterns for better oral skills. Also, we don’t ask you to repeat dialogs anymore but to build your own. Advanced Students interested in this level should consult in advance for our arrangement. We can answer to many propositions such as “Keigo pratice”, “Business Japanese”, “Oral level up”…please let us know during your registration.